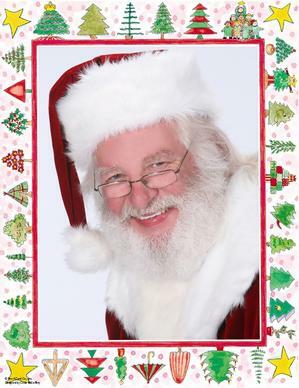 "Twinkly Blue Eyes & an Infectious Smile"
When you contact Real Santa Jim: Santa, Mrs. Claus, or one of their Elves will provide you with a more detailed list of services and their associated costs. We will tailor our visit to meet your needs. 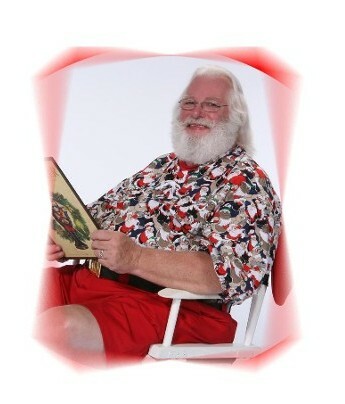 Once you contract with Real Santa Jim: We will provide you with a Confirmation of our Contract, and a list of Handy Hints to allow you, as the host, to have the best Santa Visit possible. After we perform for your Santa Visit event: We will provide you with a Santa Visit Questionnaire to allow you to assess our performance at your event. This helps us to constantly improve our Santa Visits. Home Visits: We will come to your home ... and meet you outside, if you like, to fill Santa's sack with your gifts for your guests. Then we will make a grand entrance. We will talk with the kids, and if time permits ... read to the kids. Mrs. Claus will help your photographer keep track of the kids, their names, etc. We will attempt to mingle with each and every person at your event. These visits have a 1st hour charge and a somewhat lower additional hour charge. Neighborhood Assoc / Office / Corporate Visits: These visits are similar to the home visits and can include kids or just be for adults only. Again, we can meet just ahead of time to sack your gifts for your guests. We will make a grand entrance and sit with the kids and/or adults. We will work with you ahead of time to tailor the visit to make the Santa Visit a memorable event. These visits have a 1st hour charge and a somewhat lower additional hour charge. Christmas Eve Home or Office Visits: These visits are essentially the same except the hourly rate increases significantly. Santa, Mrs. Claus, Sugar and Spice Visits: Sugar and Spice are Santa's two Elves. When available, they come along with Santa and Mrs. Claus. They aide Santa and Mrs. Claus and help with keeping the lines in some sort of order while they wait for Santa. 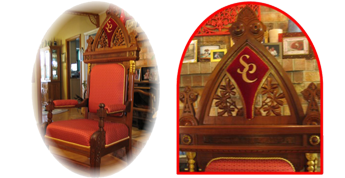 Santa Jim's Throne: Santa Jim's Son rescued this 100 year old chair that had been kept in his Masonic Lodge in Peoria, Illinois. He repaired all the joints. Then, Santa Jim brought the chair to his workshop and completely refurbished the chair. When available, this hand-carved mahogany, with inlaid burl, and richly upholstered chair is available to use at your event for a minimal charge. Casual Santa Visits: These visits are usually made during the 'off season' when the warm Houston weather is not conducive to a full Santa suit. Santa shows up 'on vacation' in shorts and more casual attire. He stops by to see if the kids are being good 'all year round' and visits with them and reads to them. Again, we will work with you ahead of time to tailor the visit to make the Santa Visit a memorable event. These visits have a 1st hour charge and a somewhat lower additional hour charge. Santa's Business Suit: Santa Jim also has an all red business suit. This is appropriate for office visits during the year to provide your employees with just a little merriment ahead of the season. Use Santa Jim to help pass out your office bonus or Christmas Turkeys. Santa Jim and Mrs. Claus are also available for Commercials and Advertising, Parades, Modeling, Christmas Tree Lighting ceremonies, Birthday Parties, Grand Openings, etc.